Figure 5.9. Simplified pollen diagram from Ngamakala, presented according to depth (Congo, after Elenga et al., 1994): (a) arboreal and climber taxa; (b) herbaceous taxa; (c) synthetic diagram (% calculated versus pollen sum including all identified taxa, aquatics, and spores). significant change at 24 kcal. yr bp is clearly identified in the pollen diagram, although postulated within a change of sediment. The minimum forest cover (60% AP) occurred at c. 17 kcal. yr bp when Sapotaceae and Syzygium decreased and Combre-taceae reached their maximum relative abundance. Although the conventional dates of the Ngamakala core have a great experimental error, the minimum tree cover at Ngamakala appears synchronous with grass maximum frequencies at Barombi Mbo from which maximum aridity has been inferred. Simultaneous abundance of aquatic herbs, among which Xyris and Nymphaea dominate, may be explained by a water depth lower than 1 m. The Ngamakala record lacks evidence for cooler indicators, and therefore the decoupled effect of coolness and aridity during glacial time is not established yet for the southern tropics until further high-resolution pollen sequences are provided. Past vegetation history of the rainforest during glacial time is only documented at two sites so far. It clearly indicates the persistence of two well-diversified rainforests of different composition on both sides of the equator. Figure 5.10. Locationmap of fossil pollen sites. Bm: Barombi Mbo; Mb: Mboandong; O: Ossa; Ka: Kamalete; N: Ngamaka; Si: Sinnda; Bi: Bilanko; Ki: Kitina; C: Coraf; So: Songolo. abundant Syzygium (Figure 5.10). Shrub savanna vegetation occupies sandy soil in this region, characterized by 1,600-mm/yr rainfall, 4-month dry season and 4 to 6°C seasonal temperature range. The 60-cm short core, recovered from the 4 m thick peat deposit inside the depression, contained a wood fragment at the bottom that was dated at 10,850 ± 200 14Cyr bp, the top part of the core not being dated. Although the pollen flora were fairly diverse (103 pollen taxa), the pollen sequence was dominated by Syzygium (90% of the total count) associated with a few dispersed forest trees of semi-deciduous forest. This indicated the development of a Syzygium swamp at Bilanko. The sediment of the core—yielding dated fossil wood—contained up to 30% Podocarpus pollen (Elenga et al., 1991). Podocarpus milanjianus does not occur in the Congo Basin today, but it has been collected as isolated trees in the Chaillu Mountains, in Gabon, at the same elevation as Bilanko. Although its pollen can be transported over long distances, such high percentages imply the proximity of abundant trees nearby Bilanko, suggesting cooler temperatures during a time period corresponding to the Younger Dryas. Development of stratified low clouds has been proposed to explain occurrences of mountain plants in the lowlands (Maley and Elenga, 1993). Macrobotanical remains have been identified from two glacial-aged sites (Figure 5.1) on the Bateke plateau (Dechamps et al., 1988a). At Gaganlingolo, 17 km north of Brazzaville (3°55'S, 15° 10'E) root specimens older than 3014CkyrBP were tentatively attributed to several species of Monopetalanthus (Caesalpiniaceae), with Grewia (Tilia-ceae) and Pterocarpus (Fabaceae). So many species of Monopetalanthus within a small area is surprising and brings into question the validity of specific identifications of this fossil wood. Nevertheless, the wood documents the presence of a forest in the Congo Basin during the last glacial period on the right bank of the Congo River, in a region now occupied by savanna. At Gambona (2°S, 16°E), a few hundred kilometers north, closer to the Congo Basin, wood remains of the same age yielded a more mixed assemblage including components of open woodland—such as Nauclea latifolia (Rubiaceae)—and evergreen forest components—such as Detarium senegalense (Caesalpiniaceae), Connarus griffonianus (Connaraceae), and Brachystegia. The recovery of fossil wood at sites many kilometers apart attests to a certain geographical extension of the rainforest on land along the Congo River during the Last Glacial Maximum. Fossil wood of Podocarpus was not found in these terrestrial deposits dated prior to the Last Glacial Maximum, although its pollen was abundant in marine cores off the Congo coast (Jahns, 1996). Transported pollen from rainforest was indeed less important during the LGM than during stages 3 and 4 of the glacial period, but they showed their minimum percentages during stages 5b (90 kyr) and 5d (110 kyr) of the last interglacial, which cannot possibly be attributed to lower CO2 content of the atmosphere. latitude (Figure 5.10). However, except for Barombi Mbo, most pollen records remain incomplete, discontinuous, and insufficiently well-dated. The persistence of rich, diversified forests until the last few thousand years, evidence for several drastic forest declines, use of oil palm accompanying (or not accompanying) Iron Age civilizations and the Bantu expansion in Africa will be discussed in this section. Evergreen wet and semi-evergreen (Barombi Mbo, Cameroon) The pollen sequence from the Barombi Mbo core, yielding a record for the last glacial period discussed above, also contains one of the most complete records for the last 10,000 years (Figure 5.8). In this sequence the maximum of tree density started around 11.5 kcal. yr bp and remained constant until 2.5 kcal. yr bp, with more than 90% AP indicating a dense tree canopy cover. O/ea frequencies lower than 2% indicate that the tree had progressively disappeared from the surroundings of the lake since the beginning of the Holocene. 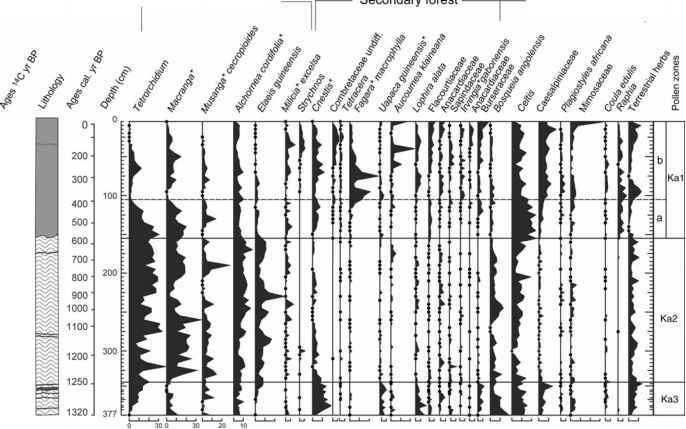 Dominated by pioneer trees (Ma//otus, Macaranga, Musanga, and A/chornea), and decreasing occurrences of Antiaris, the Holocene forest contained more Euphorbiaceae and fewer Caesalpiniaceae than the forest existing during the glacial period. The three types of forests occurring in the area today were already in place. The Biafran wet evergreen forest is attested by K/aine-doxa, Trichoscypha, Connaraceae, the coastal by Lophira/Saccog/ottis and Pyc-nanthus, the dry evergreen semi-evergreen by Mi/icia, Ce/tis, Nauc/ea, and Uapaca. The Biafran evergreen forest already existing during the glacial period appears more diversified during the Holocene with greater abundance of K/ainedoxa (Irvingiaceae), Trichoscypha (Anacardiaceae), Diospyros, and Connaraceae. But, there were fewer Caesalpiniaceae altogether than between 31 kcal. yr bp and 24 kcal. yr bp. The forest succession started at 14.7 kcal. yr bp with abrupt increases of Macaranga, then Ma/-/otus, followed by that of Mi/icia (Moraceae) which culminate around 11.5 kcal. yr bp. A/chornea reached its first peak at c. 9 kcal. yr bp. Such a progressive trend of forest took more than 2.5 kcal. yr bp to be fully established. Although it may have been triggered by increased monsoon rains, it cannot be qualified as an abrupt onset. Higher resolution pollen analysis for this interesting transition period would have allowed a valuable comparison with the fine-resolution isotopic record obtained on the same core (Giresse et a/., 1994). During the whole Holocene, several fluctuations in the pollen percentages of various components are depicted (Figure 5.8)—such as decreasing trends of K/ainedoxa, Ma//otus, and an increasing trend for Musanga. But, the c. 200-yr sampling interval of the pollen record remains too large to interpret these variations in terms of the vegetation dynamic under climatic variability attested by global changes. The strongest change depicted by the available data occurred around 3 kcal. yr bp when most components of the Biafran evergreen decreased or totally disappeared, while pioneers—such as Musanga—increased significantly. The sharp 40% peak of Poaceae attests to a short phase of open savanna around 2.5 kcal. yr bp. At that time, the increase in grass pollen was not accompanied by that of Cyperaceae, having almost disappeared during the Holocene when the lake was high and its shore immediately surrounded by forest. This is an indication that grasses may have developed inside forest openings rather than along the shoreline itself. To what extent this savanna phase is the result of human deforestation or of significant climatic aridity will be discussed later. The shallow Lake Ossa (7-m depth during wet season) is located a few kilometers to the west of the Sanaga River within the Lophira/Saccog/ottis hygrophilous evergreen forest (Figure 5.10). E/aeis guineense and Hevea brasi/iensis plantations have been recently established on the western shore line of the lake. The region is characterized by high rainfall—c. 3,000 mm/yr—with a long rainy season from March to November, followed by a short dry season from December to February (Nguestop et a/., 2004). Of the three cores recovered from Lake Ossa, one with a basal age of c. 10 kcal. yr bp shows reversed dates that indicate perturbed deposition, although the pollen attests to a well-diversified Caesalpiniaceae forest well-established around the lake since that date (Reynaud-Farrera, 1995). Another 5-m core OW 4 (3°48'N, 10°01 'E, at 8m a.s.l. ), collected from the western side, provided an accurately dated pollen sequence for the last 5.5 kcal. yr bp. The pollen data include high percentages of sedges (Cyperaceae) reaching up to 50% of the total count, these perhaps due to the proximity of the river drainage, the shallowness of the lake, and associated land partially emerged during the dry season. The exclusion of Cyperaceae as well as that of fern spores from the total pollen sum for calculating percentages of other forest components is justified by the local context (Renaud-Farrera et a/., 1996). The Poaceae were kept in the pollen sum, although some may belong to local edaphic wetlands. Poaceae reached 15% at most and, except around 2.8 kyr bp, their stable percentages would not have strongly influenced variations in other elements (Figure 5.11). Figure 5.11. Simplified pollen diagram from Lake Ossa, Cameroon, presented according to calendar timescale (after Reynaud-Farrera et al., 1996) (% calculated versus pollen sum including all the identified taxa, but excluding Cyperaceae plotted at the right-hand side of the diagram). amount. Vegetation change appears in fairly good agreement with interpretation of the mineral composition of the sediment. High fluxes of orthoclase feldspar have been interpreted as an indication of higher precipitation than today (Wirmann et al., 2001). However, a contradictory interpretation of less rainfall but high water level— indicating excess of precipitation versus evapo-transpiration—was supported by an hydrological model based upon diatom studies (Nguestop et al., 2004). Interesting variability, documented by the 50-yr resolution of diatom analysis, is not depicted in the pollen diagram provided at c. 200-yr resolution only. Discrepancies in resolution prevents further comparison between the two indicators. Between 2.2kcal. yr bp and 2kcal. yr bp, complementary pollen counts (not illustrated here) showed another Poaceae increase synchronous with a significant input of Sahara dust that also contained allochthonous diatoms, attesting the stronger influence of north trade winds and subsequent drier conditions (Nguestop et al., 2004). The Caesalpiniaceae evergreen forest around Lake Ossa appears to have been reestablished in its present composition c. 1,000 years ago. Although the wet evergreen forest was maintained, its pollen composition changed significantly throughout the last 5,000 years. To what extent such changes could be attributed to variability in the precipitation regime can be solved by performing finer resolution pollen analysis. This interesting, well-dated Lake Ossa sequence with its high deposition rate deserves further analysis. From Lake Mboandong, (4°30'N, 9°20'E, 120 m a.s.l.) located close to Barombi Mbo (Figure 5.1), a 13 m long sediment core was recovered and provides a basal age of 6.8kcal. yr bp (Richards, 1986). Although preliminary, the pollen diagram shows interesting highly diversified forest taxa throughout this period until the present day. Many tree pollen taxa have been identified, compared with just a few from herbaceous plants. The majority of pollen comes from components of the evergreen forest. High pollen percentages were from Alchornea cordifolia, an understorey tree, not specific to evergreen forest. Although there are indisputable variations in relative percentages from the Caesalpiniaceae, Euphorbiaceae, Macaranga, Uapaca, Pycnanthus, Moraceae, Celtis, Lophira, and Uncaria during the past 5,000 years, the author did not attribute them to ecological or climatic changes. The event recorded at c. 2.5kcal. yr bp—interpreted as an indication of human impact—is discussed in Section 5.4.4 concerning the oil palm. The sandy coastal plain, north of Pointe Noire, is now occupied by a Loudetia (grass) savanna with Manilkara lacera (Sapotaceae). In situ fossil wood trunks with roots have been discovered included in a humic podzol bed (4°S, 11°45'E, Figure 5.1) that spans 7.4 kcal. yr bp to 4 kcal. yr bp (Schwartz et al., 1990). The fossil wood specimens themselves have provided dates within the same time interval.Among the 117 collected specimens, a total of 20 species have been identified. These include Saccoglottis gabonenesis, Agelaea sp. (Connaraceae), and Jundea cf. pinnata (Connaraceae), Uvariopsis angolana (Annonaceae), Cassipourea barteri, C. sp. (Rhizophoraceae), Dicranolepis sp. (Thymeleaceae), Dictyandra arborescens (Rubiaceae), Grewia sp., Neuropeltis acuminata (Convolvulaceae), Rinorea cf. gracilipes (Violaceae), Com-bretum sp. (Combretaceae), Rheedia (Clusiaceae), and an unknown legume (possibly Anthanota according to Dechamps et al., 1988b). Many species of Monopetalanthus (M. microphyllus, M. pellegrinii, M. letestui, and M. durandii), among the Caesal-piniaceae, indicate that a moist evergreen Caesalpiniaceae forest existed along the coastal plain for 3,000 years c. 6.8kcal. yr bp to 3kcal. yr bp. The forest was well-diversified and, according to the authors, resembles the evergreen forest described in Mount Cristal in Gabon. Fossil wood remains indicate that the moist evergreen coastal forest, now observed in Gabon, occurred 500 km south of its present southern limit between 7.4kcal. yr bp and 3kcal. yr bp, and therefore had a greater southern extension. The taphonomic conditions of the preserved fossil—such as standing trunks in the living position—tend to indicate that the Caesalpiniaceae forest had disappeared suddenly from the coastal region of Congo and that such disappearance was not due to human deforestation. The coastal Congo region receives 1,200 mm/yr of rainfall and experiences a 5-month dry season. There is a great contrast in seasonal temperature due to proximity of the cold oceanic upwelling offshore. The existence of a moist evergreen forest implies a greater rainfall (at least 2,000 mm/yr) or a shorter dry season. Its disappearance post-4 kcal. yr bp suggests strong changes in climatic or edaphic coastline conditions (Schwartz, 1992). Two pollen sequences extracted from nearby depressions complete the Holocene vegetation history of southern Congo. The Coraf pollen sequence (4° 15'S, 11°59'E, 150 m a.s.l.) 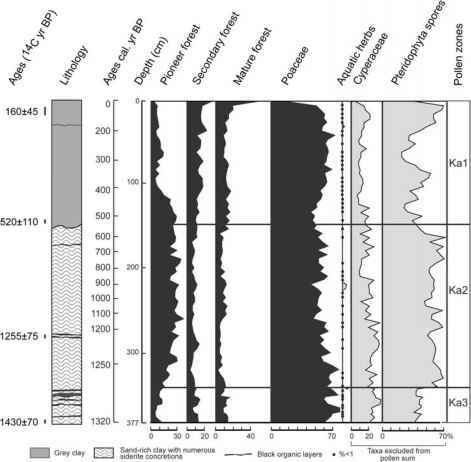 located nearby the fossil wood site (Figure 5.10) was extracted from peat deposited inside a white sand horizon, and dated from 3 kyr to 950 yr bp. It documents a swamp forest progressively decreasing toward a modern savanna. The forest decrease was interrupted by a minor Syzygium/Combretaceae/ Tetracera forest phase, dated around 1.4 kcal. yr bp. No sign of an abrupt forest decline around 2.5 kcal. 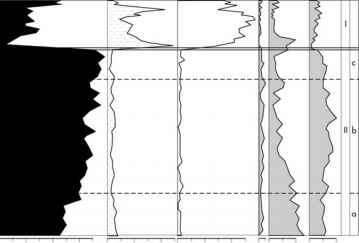 yr bp was observed at Coraf, such as that in Cameroon, but the core was poorly sampled within that interval (Elenga et al.,1992). On the Atlantic coast, north ofPointe Noire, the Songolo pollen sequence S2 (4°45', 11°51 'E, 5m a.s.l., 1,260-mm/ yr rainfall)—dated to 7.5 kcal. yr bp at its base—indicates a well-developed Rhizo-phora mangrove, following the marine transgression at 10 kcal. yr bp. The mangrove was associated with a swamp forest dominated by Symphonia globulifera, Hallea, and Uapaca. Humid conditions required for the development of swamp forest are confirmed by S13C values on total organic matter. There are significant and well-dated changes depicted in the mineralogical analysis of this core. These have no equivalent in the pollen data illustrating the coastal swamp forest, but the resolution of the pollen study is too low. The swamp forest persisted until c. 3.6 kcal. yr bp, when sedges, palms, and ferns became dominant (Elenga et al., 2001). In summary, the coastal plain of southern Congo was occupied by two different types of forests: a highly diversified Caesalpiniaceae forest documented by fossil woods, and more localized swamp forests and mangrove documented by pollen evidence since at least c. 7 kcal. yr bp. The forests persisted until 3 kcal. yr bp, clearly attesting to higher humidity or precipitation than now between 7 kcal. yr bp and 3 kcal. yr bp. The pattern of forest disappearance from the area remains unsolved and variations in sea levels should be considered. The discrepancies in dating really preclude any synchronism in various changes as proposed for an environmental event occurring at 4 kyr (Marchant and Hooghiemstra, 2004). A rather more complicated pattern seems to emerge, which needs comparison of fossil data at the same resolution interval with firmly established short-term Holocene climatic variability. Nevertheless, coastal grassland in the Congo seems to have been established only after 3 kcal. yr bp, and was interrupted by a minor forest increase again at c. 1.4 kcal. yr bp. Evergreen transitional forests dominated by Meliaceae, Fabaceae, and Irvingiaceae with a great diversity of representatives from other families occupy the Mayombe massif today (Descoings, 1976; Cusset, 1987). On the western slope of the Mayombe, Lake Kitina (4°15'S, 11°59'E, 150 m a.s.l.) is located in a valley which receives about 1,500 mm/yr of rainfall and experiences a 4-month dry season with heavy cloud cover. The lake is surrounded by swamp vegetation with Cyperus papyrus, Anchomanes (Araceae), ferns, and a few trees—such as A/stonia and A/chornea—followed by a swamp forest including Uapaca, Santiria, and Memyce/on. A transitional semievergreen dry forest—with Dacryodes, K/ainedoxa gabonensis (Ixonanthaceae), Piptadenia (Leguminosae), P/agiosty/es africana (Euphorbiaceae), Anthostema (Euphorbiaceae), and Sapotaceae—is developed on slopes (Elenga et a/., 1996). The Holocene pollen record is dated 5,460 ± 70 yr bp at a 620-cm depth (Figure 5.12). From 5.5 to 2.714CkyrBP, the synthetic pollen diagram indicates two well-developed forest associations: one from dry land (Dacryodes, Martretia, and Anopyxis (Rhizo-phoraceae)), the other from swamp (Syzygium, Ha//ea, Anthostema). Between 2.7 and 1.314Ckyr bp, four AMS dates within a 40-cm depth interval demonstrate a very low sedimentation rate (or perhaps a discontinuity). During that interval—which lasted almost 1.4 kyr—significant changes occurred. First, a sharp and important increase in dry land forest (40%) accompanied by a significant increase in amorphous silica (Bertaux et a/., 1996) shows that Lake Kitina partially dried out. The successive increase in pioneers (Macaranga and A/chornea), associated ferns, and Poaceae (c. 10%) indicates a greater extent of swampy conditions contemporaneous with the appearance of E/aeis guineense. Although these pollen changes appear depicted as an abrupt 2.714Ckyr bp event, several episodes of reduced lake level are shown by the lithology (Figure 5.12). No detailed modifications of pollen taxa composition have been provided for documenting the effect of aridity on the composition of the forest. There is no evidence for human impact either (Elenga et a/., 1996). The return to humid conditions after 1.314Ckyr bp is attested by swamp forest pollen rather than a decrease in dry land forest. But, pollen from dry land forest increased again at 0.514Ckyr bp. The Kitina diagram clearly indicates that the composition of the Mayombe forest is recent—no older than 500 years at most. Figure 5.12. Simplified pollen diagrams from Lake Kitina (from Elenga et al., 1996) and Sinnda, presented according to depth (after Vincens et al., 1998) (% calculated versus pollen sum including all identified taxa, Cyperaceae, and spores). The geographical location of Lake Sinnda (3°50'S, 12°48'E, 128 m a.s.l. )—inside a large band of wooded grassland separating the two massifs of Mayombe and Chaillu within the dry semi-evergreen forest to the south—is particularly interesting for addressing the origin of included grassland (Figure 5.10). Here, mean annual rainfall is about 1,100 mm/yr with a 5-month dry season from mid-May to mid-October. Two well-dated cores analyzed for both pollen (Vincens et al., 1994) and phytoliths (Alexandre et al., 1997) provide evidence for a well-diversified dense forest from 5,240 ± 70 to 3,990 ± 70 yr bp (Figure 5.12) with little impact of pollen from grasslands (Vincens et al., 1998, Figure 5.4). Dominated by Chlorophora (Moraceae), Alchornea, Celtis, Pausinystalia (Rubiaceae), Macaranga, and Lannea (Anacardia-ceae), and a great variety of taxa, the fossil pollen indicates a semi-evergreen (semi-deciduous forest). Noticeable changes occurred. Phoenix, Myrianthus, and ferns are well-represented before 514CkyrBP, whereas Celtis—associated with Caesalpinia-ceae, Fabaceae, and many Euphorbiaceae—increased at about 4.514Ckyr bp. But, the most obvious change observed at Sinnda is situated in the interval between c. 4 and 1.214Ckyr Bp when a strong gap is registered in the sedimentation of the core. After that gap, the pollen assemblages were dominated by grasses and sedges, evidencing greater development of marshes, now existing at the northeast end of the lake. The forest was considerably impoverished in taxa, although Ulmaceae (Holoptolea, Trema, and Celtis) and Chlorophora accompanied the Alchornea still present on the steep shores of the lake. The abrupt character of such a change results from a gap of more than 2,000 years, likely corresponding to an arid period when the 4 m deep Lake Sinnda dried out. Many forest trees disappeared during that interval. Although this is the most obvious post-4 kyr bp change observed in the region, the fact that the lake is shallow, located at the ecological limit for forest growth with a long dry season, and that the pollen percentages decreased abruptly at the discontinuity of the core maximize the impact of climatic change probably responsible for this pattern. Positive evidence for forest changes is missing. A second core in the central part of the lake contains black organic layers with abundant plant remains indicating that two subsequent drying phases occurred: one at 4.5 kyr bp followed by another post-1.714Ckyr bp. An increase in tree forest taxa (AP > 40%) at the upper part of the core dated 650 ± 60 yr bp points to a recovery of the forest nearby. The pollen curve of the possibly cultivated Elaeis guineense became significant only during the last 600 years, probably linked to possible settlement by Bantu-speaking proto-agricultural people (Schwartz, 1992). Charcoal dated 2,130±70yrbp, on the Bateke plateau, and 1,600 yr bp in Mayombe clearly support the long use of fire in the region (Schwartz et al., 1990). A date of 1,350±70yrbp obtained on burned specimens of Erythrophleum suaveloens (Caesalpiniaceae)—a ubiquitous tree, used by local people for its toxic alkaloids and extracted from archeological sites—confirms human fire usage in Mayombe (Dechamps et al., 1988b). 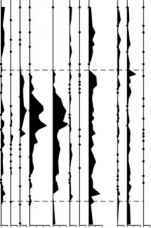 From the Sinnda record itself, it cannot be exactly established when (between 4 and 1.214C kyr bp) the savanna spread in the Niari Valley, but grasslands are present once fire is introduced at c. 1.2 kcal. yr bp. Near the right bank of the Congo River three cores were recovered from the Ngamakala pond (4°04'S, 15°23'E, 400 m a.s.l.) which yielded records from the glacial period (see above). None of them yielded a complete Holocene sequence. In one core, there is only 20-cm sediment deposited between the two conventional radiocarbon dates of 10,880 ± 160 and 3,940 ± 130 yr bp (Elenga et a/, 1994). Their pollen content corresponds to a Syzygium/Sapotaceae swamp forest, but accurate age determination is not available. Another core provided a 1 m thick accumulation of peat deposited between c. 3 kyr and 1 kyr bp, attesting to the retreat of swamp forest at the expense of grasslands during that interval. A significant expansion of swamp Syzygium forest re-occupied the pond again at 930 ± 140 yr bp. Although far from being complete, the succession of forest associations nearby the Congo River emphasizes many successive steps of changes during the Holocene. Among those the opening of the forest at Ngamakala is sharply registered at c. 3.314Ckyr bp. But, this cannot be considered synchronous with any of the events at 4 or 2.514Ckyr bp previously discussed. During the last 5,000 years the evolution and dynamics of the rainforest forced by climatic changes appear rather complicated. Apparently, they do not depict the same pattern north and south of the equator, but the lower Holocene record is missing (or discontinuous) at all the sites except at Barombi Mbo in Cameroon. There, the depicted changes indicate significant climatic variability during the Holocene, but there is no clear identification of an "African humid period" prior to 6 kcal. yr bp. At most sites, negative evidence and lack of sedimentation during the early Holocene may attest to drier climatic conditions. Hence the status of rainforest existence at that time and composition remains unknown. The results summarized here firmly establish that evergreen and semi-evergreen rainforests persisted between 6 kcal. yr bp and c. 3kcal. yr bp at all of the nine investigated sites. Slightly before or after 3 kcal. yr bp, major vegetation changes are documented (Vincens et a/., 1999). Because of discrepancies in the resolution of the analysis it is not clear, however, whether these changes reflect several short-term episodes of climatic variability at a millennial scale concerning seasonal distribution of rainfall, or a longer single event. One major vegetation change documented in Cameroonian sites is well-bracketed between c. 2.8 kcal. yr bp and 2.2 kcal. yr bp. Elsewhere, more attention needs to be paid to their chronological control (Russel et a/., 2003). Discrepancies in the stratigraphy, gaps in the sedimentation, different time resolutions of pollen data, as well as local climatic conditions relevant to length of the dry season, prevent the correlation of changes at all the sites within a single event. The proximity of a lake or rivers could maintain edaphic forests. Although reduction in the hydrological budget and lowering lake levels have been documented simultaneously by geological studies (Servant and Servant-Vildary, 2000), Upper Holocene aridity was not an irreversible climatic event. Many sites indicate the return of wetter conditions during the last millennium, creating favorable conditions for new forest expansion again between 0.9 kcal. yr bp and 0.6 kcal. yr bp (Vincens et al., 1996a, b; Elenga et al., 2004). On the other hand, the synchronous expansion of grasslands at c. 2.2 kcal. 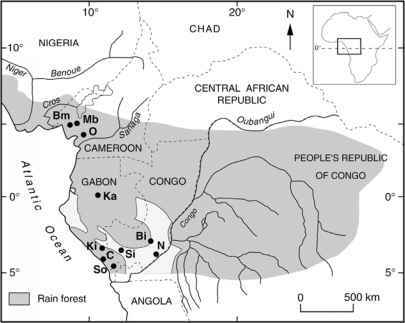 yr bp in lowlands, on the eastern side of Mount Cameroon, nearby lakes Barombi Mbo (Maley, 1992), Mboandong (Richards, 1986), and Ossa (Reynaud-Farrera, et al., 1996) is in good correspondence with the Iron Age. But, whether such expansion was climatically controlled or human-induced does not reach a consensus among different specialists and remains a matter of speculation (Maley, 1992; Schwartz, 1992). Highresolution diatom analysis of the Ossa core provides new, interesting data for the climatic interpretation of the complexity of that event. In striking correspondence with the 2.7 kcal. yr bp North Atlantic cold event (Bond et al., 1997), in Africa an increase in lake level and rainfall is bracketed by two strong amplitude shifts to drier conditions. The first was interpreted as a decrease in rainfall. The second lasted a few hundred years when decrease in water level and stronger input of allochthonous diatoms transported from Lake Chad indicate reinforced northern winds responsible for stronger aridity between 2.3 kcal. yr bp and 2 kcal. yr bp. The high-amplitude oscillations registered at Ossa suggest that a further high-resolution study of the nearby high-elevation Bambili lake (Stager and Anfang-Stutter, 1999) would be worthwhile. Synchronous vegetation change between a Caesalpiniaceae/Lophira-dominated forest before 2.5 kcal. yr bp replaced by an Alchornea/Macaranga open forest after 2.3 kcal. yr bp could well be explained by an increased length in the dry season and possible effect of low subsidence and storms following movement of the ITCZ (Nguestop et al., 2004). Such an interesting hypothesis might receive more support when higher resolution pollen data have been obtained. An increased proportion of Elaeis guineense (oil palm) in the Ossa pollen record occurred simultaneously, which brings to the fore the fact that several dry episodes—also expressed at Kitina and Sinnda—created consecutive openings through the equatorial forest. These gaps offered a possible direct route for the Bantu migrations from Cameroon to the south. 5.4.4 The oil palm, evidence for human impact? Canarium schweinfurthii, clearly distinguished from other Burseraceae—notably Aucoumea (Harley and Clarkson, 1999; Sowunmi, 1995)—was recorded at c. 5kcal. yr bp, suggesting an earlier presence of humans nearby the fossil pollen site. Early evidence of oil palm pollen is known since the Tertiary in the Niger delta (Zeven, 1964), and was reported in Upper Pleistocene marine sediments offshore the Niger River (Dupont and Weinelt, 1996). However, it is only during the last 3,000 years that the proportion of Elaeis guineensis pollen reached significant values (up to 24%) in the Niger delta (Sowunmi, 1999). As a "palm belt", present day natural distribution of the oil palm follows the gulf of Guinea and largely penetrates inside the Congo Basin. Elaeis guineensis is an heliophytic pioneer species, also fire-resistant (Swaine, 1992), which occurs naturally in a great variety of habitats inside the rainforest including swamp and at its periphery (Letouzey, 1978). All these characteristics largely contribute to the difficulty of interpreting their fossil record. 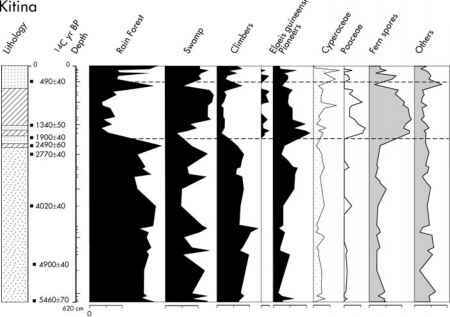 The pattern of occurrences and abundance of Elaeis guineensis pollen through time is not similar at all the investigated sites, and this led to controversial interpretation. In Ghana, archeological remains indicate an earliest use at 5.8 kcal. yr bp (Shaw, 1976), but its fossil pollen became abundant only after 3 kcal. yr bp in the Niger delta. The common pattern in the three Cameroon sites, starting with scattered Elaeis guineensis occurrences from c. 4kcal. yr bp to 3 kcal. yr bp, followed by a significant increase at c. 2 kcal. yr bp (Richards, 1986; Reynaud Farrera et al., 1996; Maley and Brenac, 1998) is remarkable. At Barombi Mbo the peak of oil palm pollen (2.9 kcal. yr bp to 2.4 kcal. yr bp) corresponds to the 2.75kcal. yr bp crisis (Van Geel et al.,1998) or "dramatic forest decline". It occurs a few hundred years earlier than the peak of grasses (2.7 kcal. yr bp to 2.2 kcal. yr bp) and much earlier than the Bantu invasion (2.2 kcal. yr bp to 2kcal. yr bp) (Schwartz, 1992; Maley, 2001). Therefore, Elaeis guineensis increased in response to increased aridity happening in the rainforest a few centuries before the spreading of oil palm by Bantu speakers. In contrast, several papers discussed the past record of Elaeis guineensis in West Africa (see Sowunmi, 1995 for an exhaustive literature), possibly enhanced by Bantu speakers (Schwartz, 1992; Maley, 2001). In Gabon, Neolithic populations had occupied the savanna of the Ogoue Valley since c. 3.7 kcal. yr bp and the main expansion of iron-smelting dates at c. 2.2 kcal. yr bp (Oslisly and Fontugne, 1993; Oslisly, 2001). Abundance of oil palm pollen happened at a coastal site around 3 kcal. yr bp, following forest reduction 1,000 years later. At Kamalete, inland, it is registered much later, during the warm medieval period from 1.2 kcal. yr bp to 0.3 kcal. yr bp. There, the oil palm phase is registered simultaneously within the pioneer forest phase, showing a significant peak at 0.9 kcal. yr bp, during a gap in human occupation (Ngomanda, in press). At the Songolo mangrove site (Congo coast line), scattered occurrences of Elaeis guineensis pollen have been found from 3.6 kcal. yr bp onward (Elenga et al., 2001), but no significant increase has been observed until the last centuries, neither at Ngamakala and Bilanko nor Kitina and Sinnda (Vincens et al., 1998). At inland sites, climatic conditions may have been too dry for the development of oil palm (Elenga et al., 1996, 2001). Occurrences of oil palm are apparently associated with increased grass pollen or a more deciduous character of the forests (Vincens et al., 1996a, b). But, their peaks in abundance are not synchronous events and the geographical distribution pattern through time is far from being spatially and geographically consistent. Our available knowledge can be summarized by the following conclusions. First, there was a greater evidence of oil palm pollen during the last 3,000 years over the Guineo-Congolian rainforest. 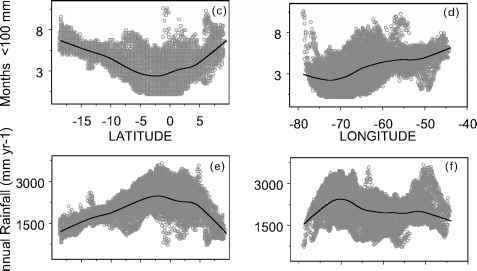 Second, simultaneity of forest openings and use of oil palm by human populations is not demonstrated at all the sites with sufficiently accurate time control or fine-resolution interval. Third, geographical progression of the use of oil palm, following Bantu migration, remains to be demonstrated. The oil palm has a very short reproductive cycle, and it can indicate simultaneous use by humans following—by a few years—anthropogenic or natural forest perturbation. Fourth, proof of anthropologically enhanced modifications of the rainforest, prior to the last few centuries, has yet to be provided. Important past vegetation changes inside the moist evergreen Guineo-Congolian rainforest have been evidenced in the historical period within core sediments obtained from Lake Kamalete in central Gabon (Ngomanda et a/., 2005). Within the forest of the Lope National Park, Lake Kamalete is located inside a 60 km long strip of savanna interrupting the Maranthaceae forest, whereas the closed canopy forest stands at c. 20 km west of the lake (Figure 5.1). Situated at the end of a valley, not far from the Ogooue River, the shallow Lake Kamalete is surrounded by a mosaic of savanna and isolated fragments of Marantaceae forest. Sedges (Cyperaceae) and ferns colonize its shoreline (Figure 5.13, see color section). In this area, precipitation oscillates around 1,500 mm/yr, a low value for Gabon due to the rain shadow effect of the Cristal Mounts on the western side. But, present day meteorological values show great inter-annual variability related to variable timing and duration of the dry summer season (June to September) when the Inter Tropical Convergence Zone (ITCZ) moved to the northern hemisphere. During the dry season, dense cloud cover maintains high relative humidity and slightly lower temperature when sea surface temperature drops out. A c. 4-m core recovered from Lake Kamalete (0°43'S, 11°46'E, 350 m a.s.l.) was dated by four conventional radiocarbon dates, providing a basal age of c. 1.3 kcal. yr bp. Fine-resolution pollen analysis of the order of one or two decades documents important past vegetation changes and detailed composition of the moist evergreen Guineo-Congolian rainforest (Ngomanda et a/., 2005). The original fossil pollen sequence includes 80 samples and counts of 124 identified pollen taxa. A simplified version is presented here (Figure 5.14). In this context, fern spores, grasses, and sedges produced the highest quantities of pollen. Grass pollen percentages average 70% of the total pollen sum (after spores, aquatics, and sedges had been excluded) indicating persistence of a forest-savana mosaic at the site. Because significant pollen counts had been achieved at each level, a detailed diagram could be drawn for forest arboreal pollen (Figure 5.15). Among palynologists it is assumed that pollen abundance is related to abundance of trees, rather than to direct yearly pollen production, although this might deserve consideration when 1-cm sampling represents 2 or 3 years of pollen deposition. Figure 5.14. 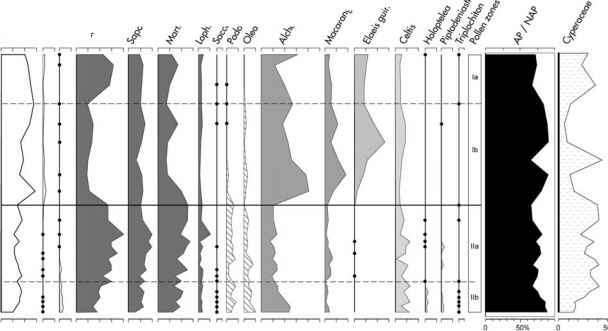 Synthetic pollen diagram from Kamalete, Gabon (after Ngomanda et al., 2005), presented according to depth with corresponding time scale (% calculated versus pollen sum including all identified taxa, Cyperaceae, and spores).